So, this week I’ve been doing a lot of thinking about what it takes to be a good RPG player rather than a GM. I’m actually in the process of wrapping up a very successful Shadowrun campaign as the GM, and I have to say that this game would not have been nearly as fun or engaging without the players being as great as they are. A lot of emphasis is put on the GM’s shoulders for making a game fun, but I also believe that the players’ active participation is a hugely significant factor. Let’s take a closer look at what I believe are some good player behaviors, shall we? Just as a quick disclaimer before we get too far into the rest of this article; YMMV. I’m using my own experiences and observations as the basis for the advice and discussions hereafter, but I certainly would not say that all groups are going to respond the same to trying some of these ideas out. Hosting the game can be a great way to contribute. If you can’t host, consider offering to help out with food or drink arrangements. Even something as simple as volunteering to help the GM keep the event organized (such as sending out e-mail reminders or double-checking availability) can keep the game running on track. A well-stocked library never goes amiss! It can be criminally easy to forget some basic gaming materials; books, dice, or even your character sheet! However, a good player does his best to remember to bring these vital items to each and every game. Hauling along some extra dice, pens & pencils, or some dry-erase markers can make you one heck of a valued member of the team! There is often a bit of downtime here and there during an RPG; maybe another character has the spotlight, maybe everyone else is taking a 5-minute smoke break, or maybe the GM has drawn one of the other characters aside to provide some unusual information. It’s okay to get out your phone or ipad and distract yourself every so often. However, what is vital is to not distract the other players from the game itself. If you’re going to play a game or watch a video, turn the volume way down or even switch it off so that you’re not interfering with other people’s fun—that’s just not kosher. One thing I’ve always sought to do when joining an RPG group is to find a way to make a character that brings something different to the table. Often, this is as simple as asking a few questions of the GM or the group and finding out what particular types of characters are lacking. What I think is most important about this particular activity is to make sure your character doesn’t step on another’s toes. This can also be an example of just making a character that’s too similar to someone else’s. There’s room for all kinds! I played in a Deadlands campaign in Louisville, Kentucky in the early 2000’s. My character was a riverboat gambler, an excellent shot with a gun, and knew a bit about the nasty creatures of the Weird West. 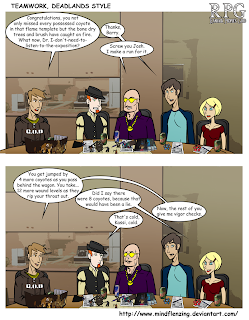 Unfortunately for me, I joined the group after my friend George had already brought in his character; a gunslinger based on Jonah Hex who happened to be good at (wait for it) gambling, shooting, and knowing stuff about the supernatural. It didn’t take long before our characters were tripping over each other in nearly every scene, and I definitely wish I had taken my own advice in this incident. Don’t just be a bump on a log! Find ways to engage your character in the action. Try and find one moment each session where you try and do something awesome. Often, it doesn’t really matter even if you succeed or fail. What’s important is the attempt, and what it says about your character, his role in the group, or what lies in store for him in the future. 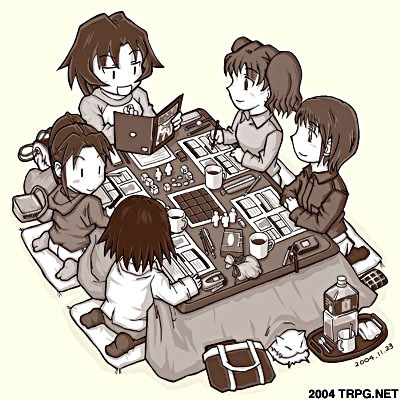 At the end of the day, the session will be more memorable and fun for everyone if the other players all feel like everyone was involved. If there is obviously someone “just kind of there” throughout the session, it doesn’t carry the same impact. The spotlight is that moment during the game when your character is the center of attention – it can be an intoxicating feeling! A good player knows that it is good to share that feeling with the rest of the group rather than hog it all to yourself. Find ways to help the other players have their “shining moment of awesome” at least once per session. If the characters are split up or working on different paths towards the same goal, find ways to incorporate the other players into the scene. 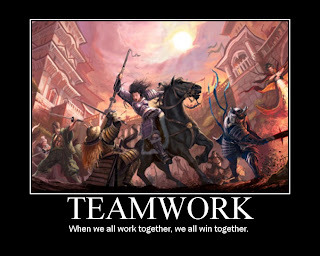 Have your character give them a call, send a message, or just openly wonder aloud “What Xander would make of all this?” If you can enable the other players to have just as much fun in the spotlight as you do, then you can pat yourself on the back – you’re well on the way to being a good player. Being a good player is also about playing nice with the GM; be part of the solution rather than part of the problem! This is a big one; I’ve always been a proponent of increased communication between the GM and players, but it is important not to overlook that players can and should initiate communication as well. Take a moment to talk to the GM about your character every so often, just to touch base and make sure the GM understands something about where you’d like to take the character. This can be expressed mechanically through the direction you want the character’s abilities to grow or develop. It can also just be in relation to the story; for example, if you would really love to get your character involved the elven war happening on the other side of the mountains, it is a good idea to remind the GM about that every now and then just to keep it fresh in his mind. Another part of communication with the GM is providing feedback about the adventure and campaign as a whole. What do you like? What don’t you like? If you could change one thing, what would it be? What are you most looking forward to doing or achieving before the end of the game? Answering these questions and talking them over with the GM can really help him not only prepare for next session but for the rest of the campaign. If possible, get the other players involved in the discussion – maybe you can discuss the goals and desires of the group as a whole, or address any issues that may be keeping the game from quite hitting the high points that it could otherwise reach. As with all communication with your group, be sure to keep things respectful and polite – giving feedback should be something you do because you love the game, not offer you a chance to tell everyone just what they’re doing wrong! Sometimes the GM is going to present a twist in the story that’ll make you say “Huh. Wait, really?” Sometimes, you’re not going to agree with a rules decision. Sometimes, you’ll want to speak up when a spell or an ability doesn’t quite work the way the book says it should. Here’s the thing—a good player lets it go. By all means, bring it up after the session if you feel it is important to your enjoyment of the game, but don’t bring the action to a screeching halt to tackle an issue right then and there. If the issue happens to be something dealing with the story rather than the rules, this advice means to give the GM a chance. Sometimes, GMs like to experiment, to change things up in their gaming style in an attempt to keep the game feeling fresh and to keep the fun times coming. I’ve been known to do this myself from time to time, and I always appreciate it when my players just nod and say “Okay. What’s next?” rather than throwing a fit. Going with the flow also means meeting the GM halfway when it comes to the pacing and the flow of the game. If there’s an obvious plot hook hanging around, consider biting at the hook rather than trying to be all “Lone Wolf” and searching for another answer. Even if you know for certain that the giant monster attacking the city is a red herring for the real crime happening elsewhere, a good player will at least think about engaging with the giant monster for a round or two just to give the GM a chance to showcase an encounter he’s obviously spent some time preparing. Try some new things! This can be as simple as choosing to play a different character type (a rogue instead of a paladin, for example), but perhaps more meaningful and interesting is to choose to play a character that is markedly different from others you have played before. For example, I have a friend who consistently likes to play anti-authoritarian rebels. In this case, to “spread his wings” would mean giving a different type of character a try, such as a constable, city watchman, or even an ambitious politician-type. Players who put some extra effort into their characters can make the game more memorable for everyone. It is not too difficult to bring a picture of your character if you can find something appropriate on the internet, or to try out some interesting and unusual “catch phrases” that set your character apart with sound as well as sight. The key here is to not go overboard. A couple of cool, unusual phrases every now and then can be fun for the whole group; talking in a nearly-incomprehensible accent all night long – not so much. One last way to go the extra mile is to consider doing some “blue-booking.” This is an approach I’ve talked about before where players can continue to tell the story of their characters in-between sessions, often through e-mail, forum posts, and the like. During my campaign of Shadows Angelus, the players did so much storytelling in between sessions that the website for the game has almost three times as many events happening in blue-booking as there were actual sessions of the game! Not to diminish your contribution, but I’m reading through the recently released BulletProof Blues superhero RPG by Kalos Comics, and it includes an extensive chapter on this very topic written by Greg Stolze. That’s well said. I approve this message.